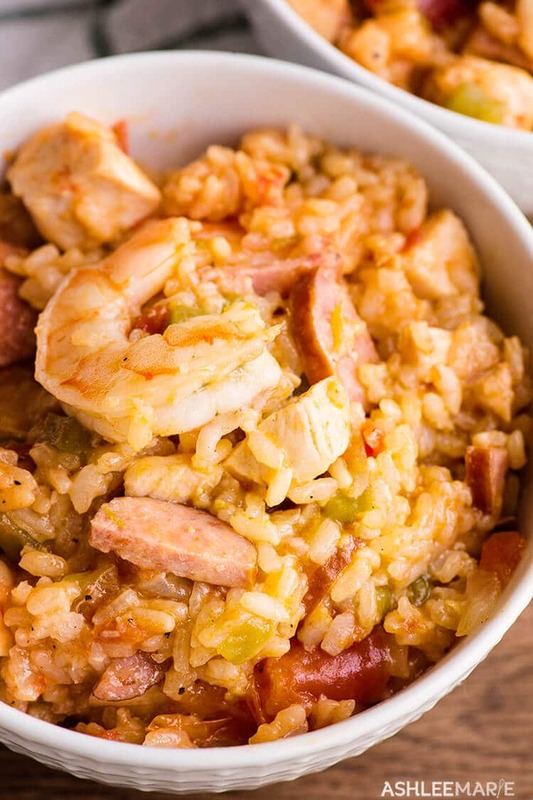 This Instant pot Jambalaya with Chicken, sausage, Shrimp, Rice and Vegetables makes a flavorful New Orleans style meal. 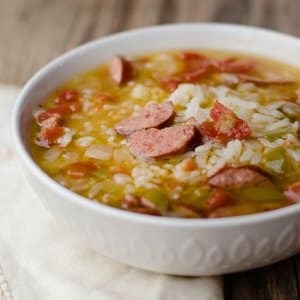 Jambalaya is super easy to cook in a pressure cooker and doesn’t take very much time. 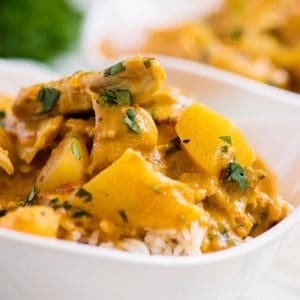 The Instant pot does a great job of melding the spice and flavors together quickly. So year ago when I was learning how to cook I bought a McCormick’s Jambalaya stove top spice mix – and fell in love with jambalaya. But of course I prefer making it more from scratch and I love making it easier if possible. So I started making rice cooker Jambalaya! 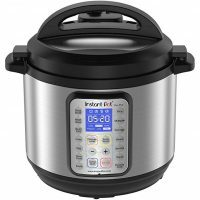 When I got my Instant pot last year I thought – this would actually be just as easy but WAY faster for making this dinner that I love! And I was right – just as delicious and seriously so quick! We’ve made this Chicken and Sausage Jambalaya like 3 times since this first time. It’s a new favorite now! Just take me to the Pressure cooker Jambalaya Recipe already! 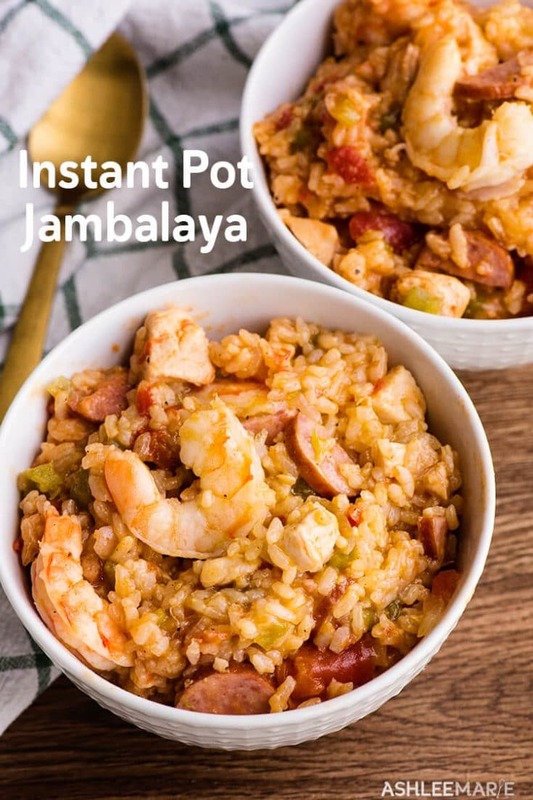 If you’d rather skip my tips and tricks for instant pot jambalaya, along with links to other instant pot recipes and other Creole and Cajun recipes and go straight to this delicious Chicken Jambalaya – simply scroll to the bottom of the page where you can find the printable recipe card. I’ve seen a lot of recipes where after browning the meat they take it out to add the veggies and other ingredients – but I personally hate taking food out and in a lot in cooking – so I leave it – just don’t over brown or cook the chicken. If you feel your chicken is dry of course you can take out the browned meat then add it again before closing up the instant pot. 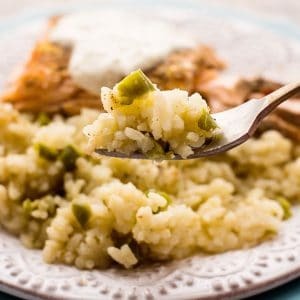 The holy trinity in cajun and creole cooking is onion, bell pepper and celery – Personally I don’t love celery so I often leave it out but then people get upset with me when I do – so it’s up to you if you use them all or not. 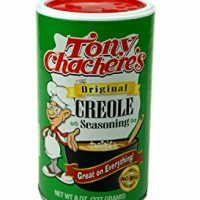 Creole seasoning – you can swap it out for Cajun seasoning if you don’t have creole seasoning. Shrimp cooks really quickly and easily so you actually don’t need to cook them. Once you do the quick release and open the pot add the shrimp and then close the lid and let it sit for 10 mins – the residual heat will cook the shrimp. I was wary the first time I tried it but it worked perfectly! 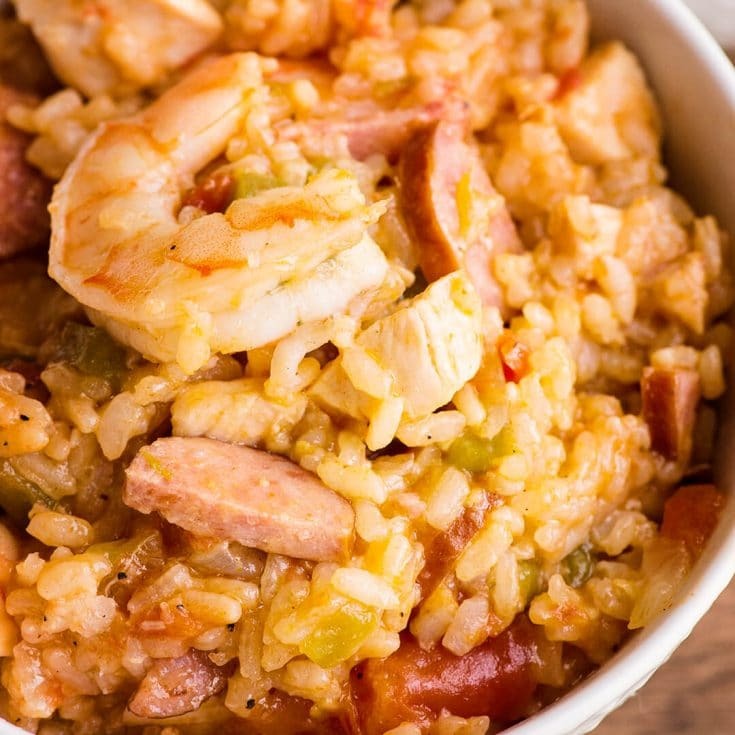 If you love this Shrimp and Sausage Jambalaya as much as we do, please leave a 5 star review and be sure to share on Facebook and Pinterest! If you want to stay updated on new recipes sign up for my newsletter and join my Facebook Group! 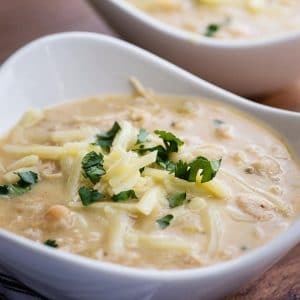 If you love your Instant Pot you’ll love these other recipes! 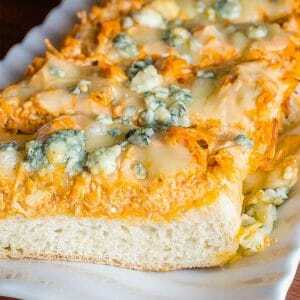 If you love Creole and Cajun recipes you’ll love these other easy recipes! 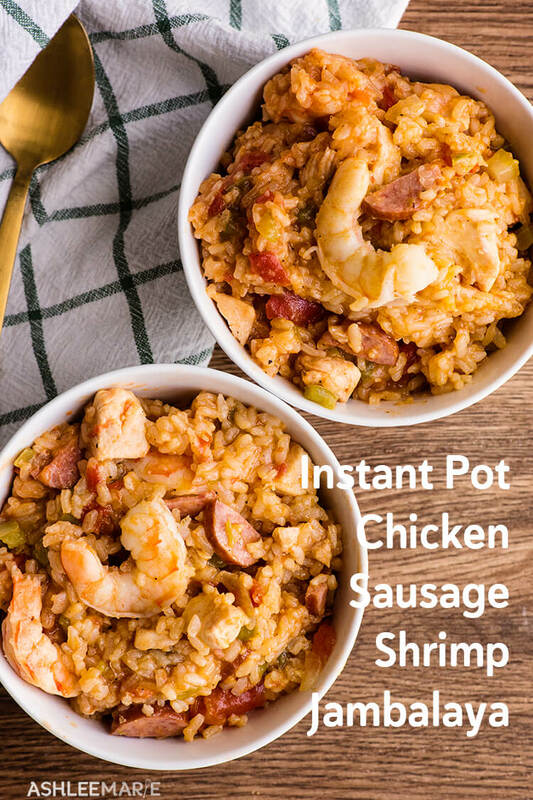 This Instant pot Jambalaya with Chicken, sausage, Shrimp, Rice and Vegetables makes a flavorful New Orleans style meal. Jambalaya is super easy to cook in a pressure cooker and doesn't take very much time. 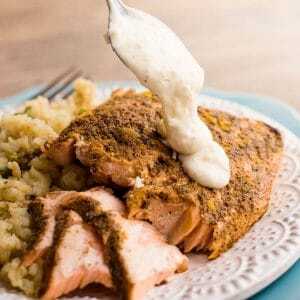 The Instant pot does a great job of melding the spice and flavors together quickly. You can cook the sausage with the chicken to brown it - it's a personal choice - I like the flavor but it does sometimes lead to the burn notification - so make sure you deglaze the pan really good when you add the broth. 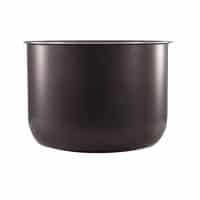 I use a nonstick inner pot to help with that. I look forward to trying this Jambalaya. But, Ashleemarie, isn’t that a LOT of salt? ?is there any way we could cut it back some? A little bit? A lot?? I still look forward to trying it.